As Warner Bros. and Legendary’s MonsterVerse continues to grow and evolve, becoming another of Hollywood’s titanic shared universes in the process, all eyes are beginning to turn toward the next installment, Godzilla: King of the Monsters. 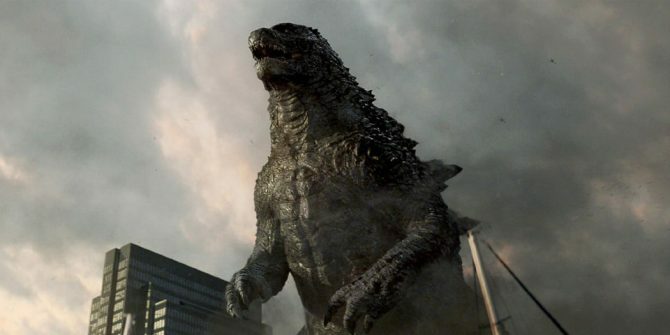 Set several years after the cataclysmic events of Gareth Edwards’ franchise-starter, when Gojira was forced to do battle with a pair of carefully crafted MUTOs (Massive Unidentified Terrestrial Objects) to comply with licensing issues, King of the Monsters blows the oversized doors off to welcome Mothra, Rodan and the three-headed King Ghidorah to the fray. Those of you who waited until after the credits of Kong: Skull Island won’t be too surprised by those monstrous new recruits, but now that filming on Godzilla: King of the Monsters is officially underway in Atlanta, Georgia, WB and Legendary have unearthed the official synopsis for Michael Dougherty’s mighty creature feature. He’ll be working from a script he hashed out alongside Zach Shields, and as you’ll see below, the top-secret organization known as Monarch continues to be the glue that binds the MonsterVerse together. The new story follows the heroic efforts of the crypto-zoological agency Monarch as its members face off against a battery of god-sized monsters, including the mighty Godzilla, who collides with Mothra, Rodan, and his ultimate nemesis, the three-headed King Ghidorah. When these ancient super-species—thought to be mere myths—rise again, they all vie for supremacy, leaving humanity’s very existence hanging in the balance. On the ground level, the film’s human cast will be headed up by Kyle Chandler, Vera Farmiga, Stranger Things breakout Millie Bobby Brown, Bradley Whitford, Ken Watanabe, Thomas Middleditch, Charles Dance, O’Shea Jackson Jr., Aisha Hinds, and Zhang Ziyi, who is all set to become a fixture of the MonsterVerse through until the release of Godzilla Vs. Kong in 2020. Death Note and The Guest helmer Adam Wingard has signed on to oversee that titanic crossover. Godzilla: King Of The Monsters, meanwhile, roars into theatres on March 22nd, 2019.